When the family takes a trip, it can be hard to leave Fido or Fluffy behind. However, when making travel decisions, choose what is safest and most comfortable for your pet. For instance, unless you'll be able to spend a lot of time with your dog, he'll probably be happier at home than tagging along on your trip. As a rule, cats are always better off in their own home. But if you have decided it's best to bring your pet along, consider these tips from the Human Society for a safe and low-stress trip. Do you know the best place for your dog or cat in your car? The safest way for your dog to travel in the car is in a crate that has been anchored to the vehicle using a seatbelt or other secure means. Dog restraints or seatbelts are useful for preventing your dog from roaming around the car and being a distraction to the driver, but they haven't been reliably shown to protect dogs during a crash. Keep your pet in the back seat of the car. If an airbag deployed while your pet was in the passenger seat (even in a crate), it might injure your pet. Dogs and cats should always be kept safely inside the car. Pets who are allowed to stick their heads out the window can be injured by particles of debris or made sick by having cold air forced into their lungs. Never transport a pet in the back of an open pickup truck. Every year, animals are killed, injured, or lost on commercial airlines. Stop frequently to allow your pet to exercise and eliminate. But never permit your pet to leave the car without a collar, ID tag, and leash. Whenever possible, share the driving and pet caretaking duties with a friend or family member. You'll be able to get food or use the facilities at rest stops knowing that someone you trust is keeping a close eye on your pets. A quick pit stop may feel like no time at all to you, but it's too long to leave your pet in a car by himself. One hazard is heat: When it's 72 degrees Fahrenheit outside, the temperature inside your car can heat up to 116 degrees within an hour. On an 85-degree day, even with the windows slightly open, the temperature inside your car can reach 102 degrees in just 10 minutes. If you're held up for 30 minutes, you may return to a car that's 120 degrees inside and a pet who is suffering irreversible organ damage or death. A year-round hazard is the unspoken invitation you issue to pet (and car) thieves any time you leave your pet alone in a car. Spread the word about the dangers of leaving pets in a hot cars. Air travel can be so quick that you may think a plane is the best way to transport your pet. Think again. The HSUS recommends that you do not transport your pet by airplane unless absolutely necessary. Air travel is particularly dangerous for animals with "pushed in" faces (the medical term is "Brachycephalic"), such as bulldogs, pugs, and Persian cats. Their short nasal passages leave them especially vulnerable to oxygen deprivation and heat stroke. Consider all the alternatives to flying. If you plan to bring your pet on vacation, driving is usually a better option. If you can't travel by car, your pet will probably be healthier and happier if you leave her behind under the care of a pet sitter or boarding kennel. If transporting your pet by air is the only option, find out whether he can travel in the cabin with you. Most airlines will allow you to take a cat or small dog in the cabin for an additional fee. But you must call the airline well in advance; there are limits to the number of animals allowed in the cabin. If you are transporting your dog, make sure she meets the size requirements. Your pet's carrier will have to pass through the security screening along with you. You have two options: Either be sure your pet is securely harnessed so you can safely contain her outside her carrier while it's being x-rayed, or request a special secondary screening that won't require you to take her out of her carrier. Animals flown in the cargo area of airplanes are killed, injured, or lost on commercial flights each year. Excessively hot or cold temperatures, poor ventilation, and rough handling are often to blame. Most U.S. airlines are required to report all companion animal incidents that occur in the cargo hold, and consumers should study the performance record of any airline before choosing to ship a pet as cargo. Always travel on the same flight as your pet. Ask the airline if you can watch your pet being loaded into the cargo hold and unloaded. When you board the plane, notify the captain and at least one flight attendant that your pet is traveling in the cargo hold. If the captain knows that pets are on board, he or she may take special precautions. Don't ever ship brachycephalic animals such as Pekingese dogs, bulldogs, or Persian cats in the cargo holds. Affix a travel label to the carrier on which you've written your name, permanent address and telephone number, final destination, and where you or a contact person can be reached as soon as the flight arrives. Make sure that your pet's nails have been clipped to protect against them getting hooked in the carrier's door, holes, and other crevices. 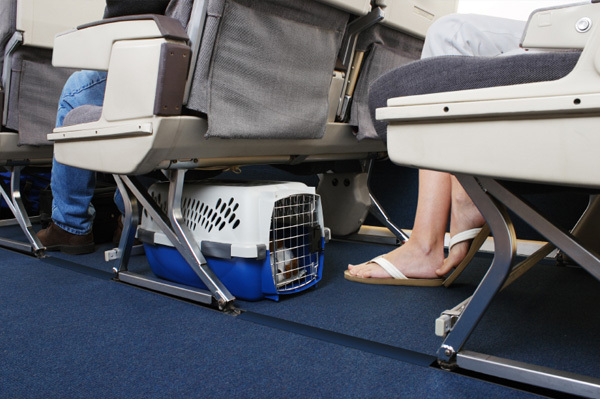 Give your pet at least a month before your flight to become familiar with the travel carrier. This will minimize his or her stress during travel. Don't hesitate to complain if you witness the mishandling of an animal—either yours or someone else's—at any airport. Ask to speak with the manager of the section where the incident occurerd and report mishandling both in person and in writing. With the exception of assistance dogs, pets are welcome on only a few cruise lines—and usually on ocean crossings only. Some lines permit pets in private cabins, but most confine pets to kennels. Contact your cruise line in advance to find out its policies and which of its ships have kennel facilities. 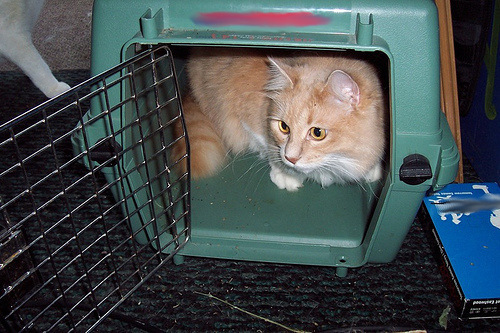 If you must use the ship's kennel, make sure it is protected from the elements and check on your pet frequently. Amtrak currently doesn't accept pets unless they are assistance dogs. The HSUS supports the Pets on Trains Act (H.R. 2066/S. 1710) before Congress that will allow Amtrak to permit passengers to bring their beloved pets on certain trains. Some smaller U.S. railroad companies may permit animals on board. Many trains in European countries allow pets. Generally, it's the passengers' responsibility to feed and exercise their pets at station stops.